Our friend Lori recently asked if we had some kid-friendly veg recipes that were healthful, included vegetables and even a finicky 8 year-old might like. We put our heads together and tried to recall what we both liked as 8 year-olds. Like anything sweet. Gooey cheese. Hot dogs. And no veggies at all, except maybe carrots. Which are sweet, too. I can recall adoring the night each week my Mom made franks and beans. Those sweet, mushy canned beans. Heaven to a child’s palate. And July happens to be National Veggie Hot Dog month. So we concocted a recipe incorporating the best of those elements, and hid some vegetables in the mix. Using a non-stick pan, saute carrots, onions and broccoli over medium-low heat in about 1/2 cup of water until tender. If the carrots aren’t soft by the time the water cooks off, add a splash more. When the veggies are ready, the onions will be translucent and the carrots and broccoli will be fork-tender. 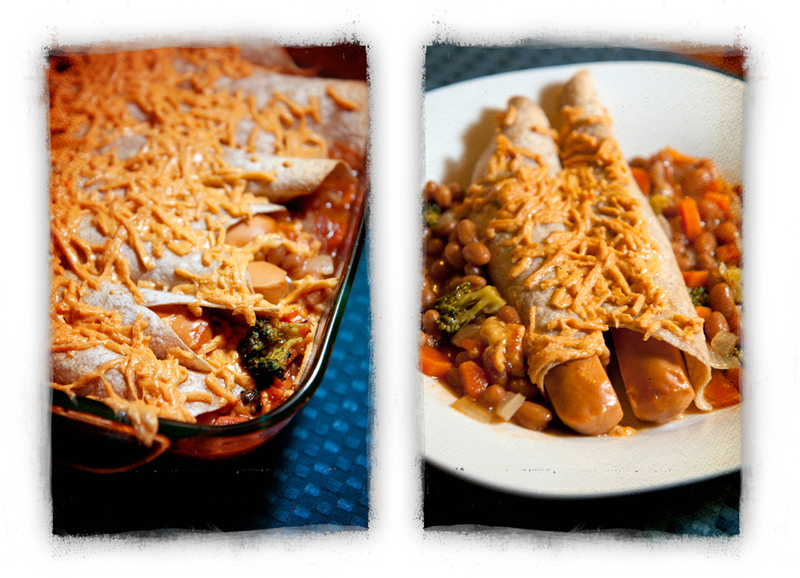 In a 8×8 oven-safe casserole, combine the cooked veggies and entire can of baked beans. Stir well to coat the vegetables in the sweet baked bean sauce. Roll each veggie wiener in 1/2 of a wheat tortilla and stack them, seam side down, on the bean/veggie mixture. When done with all 8 wieners, top the casserole evenly with Daiya shreds and cover in aluminum foil. Bake covered at 400 degrees about 15 minutes until bubbly and warmed through. Uncover and bake another 5 minutes to toast the tops of the tortillas and brown the Daiya. This recipe is really versatile. If your little ones prefer green beans, switch those in for the broccoli. Or use a can of diced tomatoes. Whatever veggies your child will eat in a sweet baked bean sauce will likely work. Oh – and my mom used to add molasses and mustard to our baked beans – you can try that too to mix it up. Lori, this is for your boys. We hope they like it! Chocolove bars are made in small batches in Boulder, Colorado. Timothy Moley is the founder, owner and chocolatier at Chocolove – a man who lives and breathes chocolate, and has been consuming two chocolate bars, every day, for the past ten years. His journey began doing volunteer work for USAID in Indonesia. While in a cocoa field there, the idea of a career in chocolate inspired him and a plan began to form – to create a premium chocolate bar, paired with the romance of love. They make a number of dark chocolate bars that are vegan-friendly and Chocolove actually uses different processing machines for dark and milk chocolates, to keep the dark candy truly dairy-free. Chocolove’s dark flavor line-up: 77% Extra Strong Dark, 70% Strong Dark, 65% Rich Dark, Crystallized Ginger in 65% Dark, Raspberry in 55% Dark, Coffee Crunch in 55%Dark, Orange Peel in 55%dark, Peppermint in 55% Dark, Chile & Cherries in 55% Dark, Almond and Sea Salt in 55%Dark, Pure Dark 55%, Cherries and Almond in 55%Dark, Fair Trade Organic with Currants and Almonds in 73% Dark, Fair Trade Organic with Cherries in 73% Dark, and Fair Trade Organic 73% Dark. How do ya like that? Yes, that’s much love to Chocolove for 16 different rich, dreamy dark chocolate bars! And each one with a love letter or poem inside. Sigh… so romantic. Where to find it? 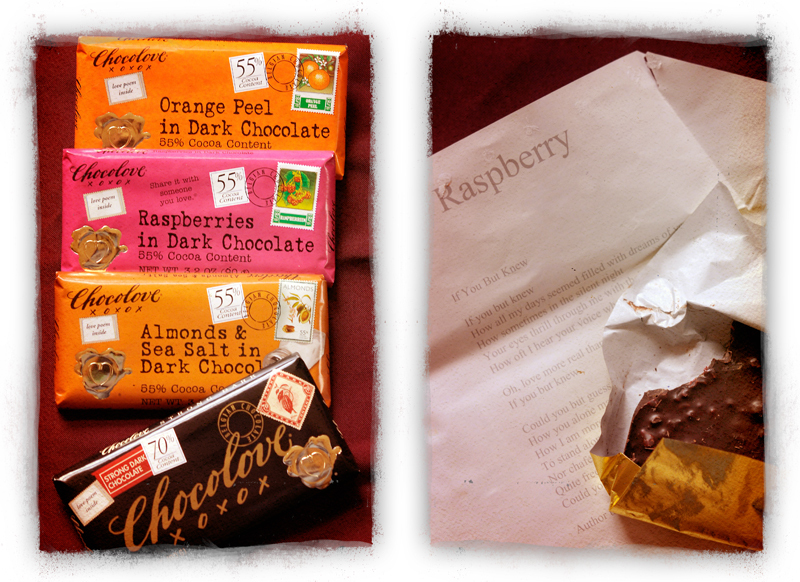 You can purchase Chocolove online from their website, or pick it up at Whole Foods or World Markets nationwide. They also have a handy online store locator, so you can find Chocolove near you. Get one for yourself, then send one to someone you love. Who couldn’t use a little Chocolove? This week we’re traveling again for work, so it seemed a great time to show off these eco-friendly luggage tags. What techno nerds (like, well, us) wouldn’t dig on a luggage tag made of upcycled computer circuit boards? We certainly love them. And you know how much these little guys stand out when your luggage is on that big, rattling metal carousel at the airport? You will be able to spot your bag from the bunch in seconds. Cuz not everyone has brightly colored luggage tags made from upcycled circuit board parts! No way, no how. Want to be eco-geek-chic yourself? These and other accessories (like business card holders and money clips and cufflinks) made from upcycled circuit boards are available from our friends at Eco-Artware.com in DC. According to the Eco-Artware.com site, the company that makes these accessories keeps about 25,000 to 30,000 pounds of circuit boards out of landfills each year. That’s way more than just geek-cool. That’s downright incredible! We love seeing good people doing good things. Like Blake, over at The Wild Pea. We’ve been lucky enough to know Blake for years – since he and his sister Whitney owned the Middle-Eastern themed Desert Cafe in Baltimore, and BG used to be a regular bellydance performer there every Saturday night. While working at the Desert Cafe Blake became inspired to try making new and different flavors of hummus: some spicy, some savory and some sweet. He and his team now use the combinations and techniques he discovered to make The Wild Pea Hummous in small batches, right here in Baltimore. Some of the savory flavors include Old Bay, Bloody Mary, Asian Fire, Black Truffle, Curry, Pumpkin Seed, Green Tea, Strawberry Basil and Ball Park (relish & kraut). Not all of the Wild Pea flavors are vegan – some have cheese or even bacon, so be sure to check it out when you are shopping. But most are good to go – and taste great. So far we’ve tried Old Bay, Curry and Asian Fire. All delish. We pick up our Wild Pea Hummous at Wegmans’ in Columbia, and they don’t have sweet flavors available there yet. But they sound fun: Keylime, Butterfinger, Cinnamon Raisin, Banana Split and PBJ are among the stand outs. There are loads more. Of course, now you want to know where you can get some Wild Pea Hummous. Well you’re in luck, it’s available locally in Whole Foods, Wegman’s, MOM’s Organic Market, and Eddie’s, as well as a few other retailers and several weekly Farmer’s Markets in the Balto/DC region. You can check out their link for locations and markets. Or you can buy it online and they will ship it right to you! Or of course, stop by the Desert Cafe and try it there. You can get other tasty vegan treats there, too! Good eats- and congrats Blake! A lot of our food comes from the Farmer’s Market and lately, that has meant a good deal of cauliflower. It’s been too hot here to really get down on cauliflower soup, so we’ve been perfecting our “mashed cauliflower” recipe. It’s very much like mashed potatoes in texture and even taste. A coupla years ago I remember mashed cauliflower was all the rage because it was on the South Beach Diet. Honestly, I never looked into the South Beach Diet cuz it didn’t seem too vegan-friendly, but I can tell you, I’m glad I was introduced to the idea of mashed cauliflower. The corn is our own addition – something else we picked up at the Farmer’s Market and accidentally discovered how tasty it is in this dish. This stuff is addicting – oh, and make it now, while cauliflower is in season! Cook cauliflower in a large pot of boiling water until tender, about 10 to 15 minutes. Test it with a fork for doneness and drain. In a large mixing bowl, combined cooked cauliflower with vegan cream cheese, Earth Balance, Daiya, garlic, nutritional yeast, salt, pepper and 1/4 cup almond milk. Using an immersion blender, mix until creamy and smooth. Add another 1/4 cup almond milk if you want/need the cauliflower to be smoother. If you don’t have an immersion blender, you can use a blender or food processor in batches – but be careful not to over-process it, or you will have soup! An old fashioned potato-masher utensil can also be used, but it will take some muscle! 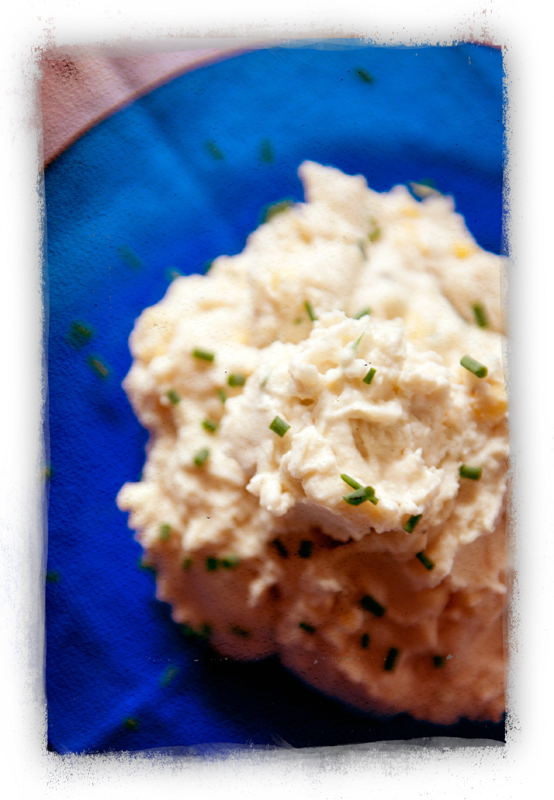 When the mashed cauliflower is at the desired smoothness, stir in the chives, parsley and corn. Serve hot. This also makes delicious lunch leftovers, too – the garlic flavor gets stronger once it sits over night in the fridge. There were three bananas on the counter. They were almost past their prime, if you know what I mean: kinda soft, with medium-sized black spots. We decided to make banana bread, but all our recipes only needed one banana, and who needs 3 loaves of banana bread? I mean, we don’t run a B&B, ya know? We got online and sniffed around for a banana recipe that used more fruit and West Philly Vegan had the answer for us: a banana bread pudding with a simple ingredient list and a topping that used three (yay!) bananas and chocolate chips. Yum! The West Philly Vegan is a gal named Christine and she adapted this tasty treat from another recipe in Vegimonicon by Isa Chandra Moscowitz and Terry Hope Romero. For Christine, she was trying to find a use for leftover bread. 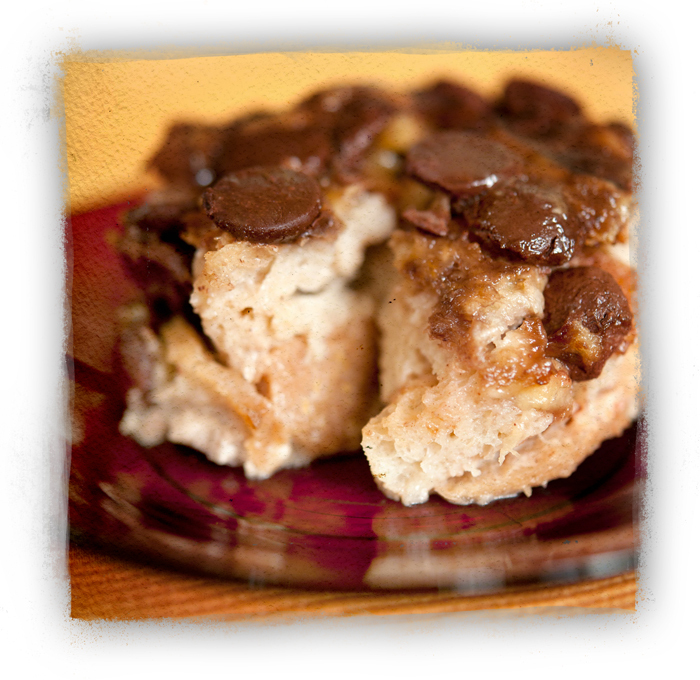 So this recipe is a winner all around: use up extra bread, use up slightly-past-their-prime bananas and eat chocolate! We altered it a tiny bit, because we didn’t have any tapioca starch on hand. Instead I added enough egg replacer to make three “eggs” and the result held together really well with great texture. This recipe is gooey, sweet and very filling. We had it both warm and chilled – it works both ways. If you eat it warm, try a scoop of vanilla soy-ice-cream on top. Heaven. It’s a comforting, home-style recipe like grandma used to make. Well, if your grandma was a funky vegan from Philly, that is. As you know, we don’t reprint recipes without permission, so be sure to check out the West Philly Vegan‘s recipe for Banana Bread Pudding. It’s the perfect way to use up leftovers and makes a delightful, sweet dessert. 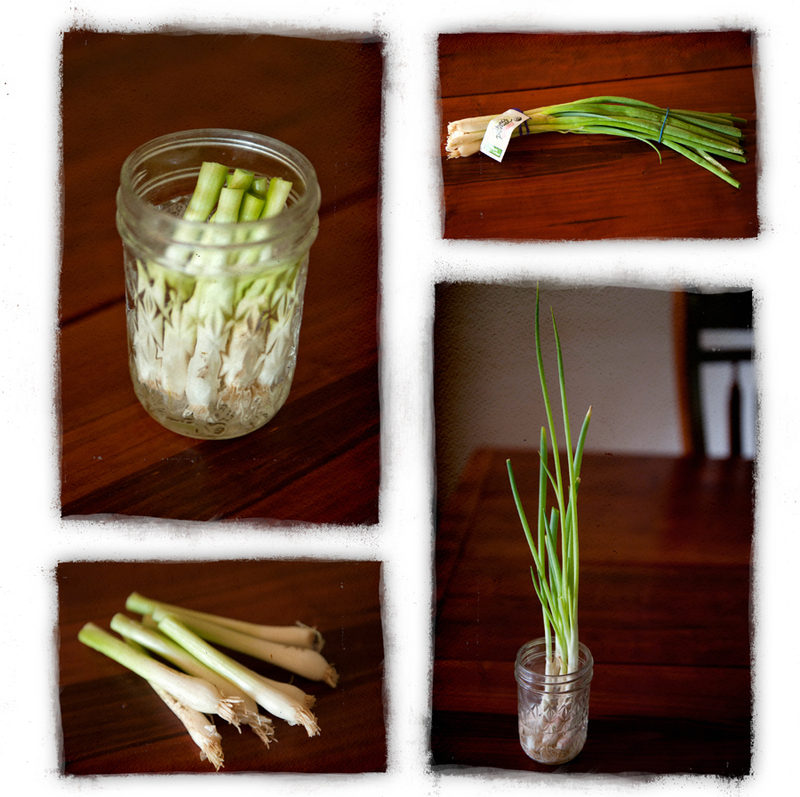 This isn’t really a recipe, but it’s so darn cool, we had to share it: Did you know you can regrow scallions after you cut them? It’s true! And what could be more perfect, cuz it seems like scallions go bad in the fridge in about 30 seconds. Here’s how it works… Buy your scallions and trim the green ends off to use. Stick the white ends into a jar/dish of water and sit them in a sunny place, like a window sill. Make sure you keep them filled with water and in about a week, you’ll have a whole second batch of scallions from the white ends! We have enjoyed watching our scallions grow. It’s crazy-simple to do this and saves money! We’ve grown then a 2nd time, too, but after two trims and re-grows, the white ends seem a little spent. Scallions, aka green onions, are frequently used in Asian and South American recipes, and they’re terrific on salads, soups and even veggie burgers. If you’re in a pinch and don’t have time to cut up regular onions, scallions work in many recipes as a quickie substitute. And since you can grow your own now, hey – why not add ’em to all your savory dishes? Thanks Becky for sharing this fun gardening tip with us! In the not-so-distant past, trying to find eco-friendly linens pretty much meant you were buying used or antique. We were fine with that, and have found lots of great choices at local vintage and resale shops. The only thing… when you’re feeding people on antique linens, you can get kind of protective. And there’s not much that’s green about linens that require dry-cleaning. Now there’s another option and it’s easy to find: linens made from recycled plastic bottles. The bottles are cleaned, crushed and repurposed into polyester yarn. For example, each napkin used to be 3 water bottles. And these recycled plastic bottle linens are super low maintenance, too. You can wash them with your laundry and dry them on low in the dryer. No worries about spills – liquids just bead up on the cloth’s surface. We have found a variety of colors of recycled plastic-bottle lines at many national retailers, including Kohl’s, where they sell under the Food Network Brand, and Bed, Bath & Beyond, where the brand is called Evolution. You can get square, rectangle and round tablecloths, as well as placemats and napkins. Perfect for everyday use – or special occasions! Just about everyone who reads blogs has heard of 101 Cookbooks. Written by Heidi Swanson, author of Super Natural Cooking, the online blog/journal is an incredible resource of whole-food, healthful recipes. It’s very well organized and easy to find what you want – she even specifically lists her 139 vegan offerings. 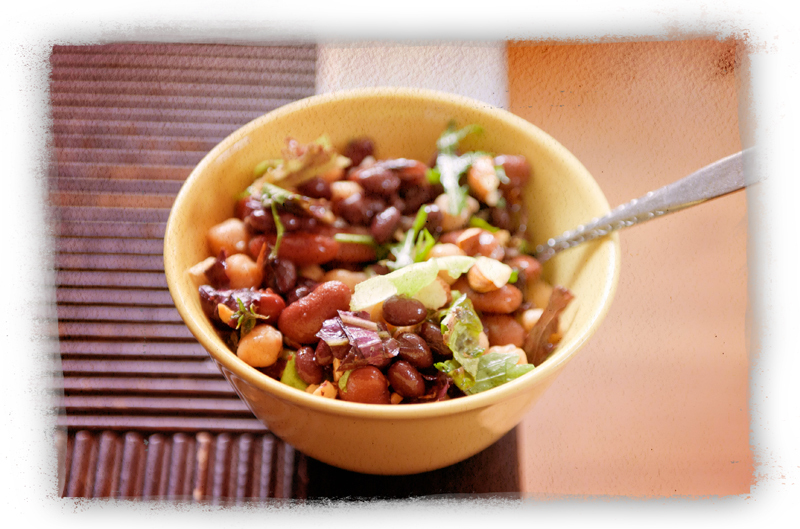 Earlier this summer, we found ourselves in need of a 3-bean salad recipe for our annual neighborhood block party. So I tried 101 Cookbooks and Heidi delivered. In her archive, we found Balsamic Honey Bean Salad. It was a simple vegan conversion, swapping the honey for agave. And there was no romaine in our fridge, but we had plentiful lettuce in the yard, so we swapped that, too! Heidi’s Balsamic Honey Bean Salad was a big hit at the neighborhood block party – it was one of the first dishes to be completely eaten. It’s nice to bring home an empty serving bowl! For us, we loved the clean simplicity of the flavors – how well the balsamic, agave and lemon blended with the fresh thyme to make a tasty salad dressing. We made the actual bean salad the night before our neighborhood block party to let the beans marinade. Right before we took it outside, we added the sliced lettuce and toasted almonds. They were crunchy with the beans and the combination is a true winner. Alas, this is one Heidi’s recipes, so we can’t print it here, but you can find it on her site, 101 Cookbooks. While you’re there, browse around – she is quite the talented writer with a huge archive of creative recipes and other goodies!